Background: Impacted upper central incisors substantially affect esthetics, function, and the self-esteem of patients. This retrospective multicenter study was designed to assess and compare the demographic and radiographic features and treatment findings for patients with impacted upper central incisors in three different countries. Materials and Methods: Diagnostic and treatment records, panoramic radiographs, and lateral cephalograms were retrieved for 74 (32 female) patients (11.24 ± 2.9 years old), with impacted upper central incisors from the USA, Germany, and Colombia, according to the preset eligibility criteria. 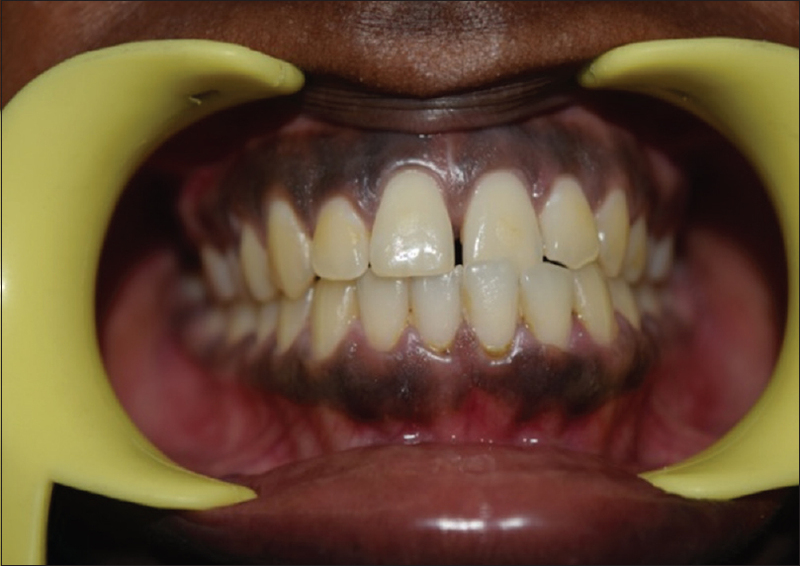 Sagittal and vertical angulation and location of the upper impacted central incisors, type of radiographic skeletal malocclusion, surgical procedures, and duration of treatment were investigated. Results: Statistically significant differences between the three groups were found for age (P = 0.003), duration of treatment (P = 0.001), and location of the impacted upper central incisors (P = 0.015). The angulation was significantly bigger for the impacted central incisors compared to the respective normal incisors (P < 0.0001). The age of the patients did not influence the treatment time. The regression model showed that higher height of impaction was associated with a closed surgical procedure (P = 0.046). Conclusions: Patients with impacted incisor treated in three different centers showed differences in terms of age, gender, treatment time, and type of surgical treatment. The surgical access with closed surgery has a direct relationship with a more apical location of the impacted incisor. Aim: The purpose of this investigation was to establish an equation for the prediction of the size of unerupted canines and first and second premolars in a Qatari population. Materials and Methods: In this study, dental casts of 100 Qataris (50 males and 50 females) were selected. The participants' age ranged from 15 to 20 years. The width of all permanent teeth with the exception of second and third molars was measured. The data were subjected to Student's t-test and regression analysis. Results: The results indicated that 15%, 25%, and 35% confidence levels were more accurate determinants of the unerupted canines and premolars than the commonly used 75% level of Moyers when both sexes were combined. The multiple regression equations revealed different confidence levels for males and females. Tanaka and Johnston's equations overestimate the predicted tooth width of the unerupted canine and first and second premolars. Conclusions: Three levels of confidence were found to be more accurate in the maxillary arch and two in the mandibular arch when compared to the commonly used 75% in Moyers' table when both sexes were combined. Therefore, three new equations for maxillary and mandibular arches are proposed to predict the size of unerupted canine and first and second premolar teeth for Qatari males and females and for both sexes combined. Background: Retention is considered as an important phase at the end of any active orthodontic tooth movement. Aims: The purposes of this study were to compare compliance between Hawley retainer (HR) and vacuum formed retainers (VFRs) and to detect the reasons for noncompliance. 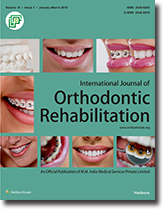 Materials and Methods: Questionnaires were distributed to those who had an orthodontic treatment and currently have experience with the orthodontic retainer. Items included demographic information and questions pertaining to treatment satisfaction, perceived responsibility for retention, type of retainer prescribed, Likert scale to detect the reasons for discontinuing use of retainers, and relapse. Chi-square and t-test were used to compare the data. Results: Out of the 150 questionnaires distributed, 98 returned and seven were excluded from the study. The compliant groups were 40, whereas the noncompliant group were 51. Sixty-four (70.3%) of the participants were using HR, whereas 27 (29.7%) were using VFRs retainer. Seventeen percent (Hawley) and 15% (VFRs) of the participants who did not comply reported that they had lost their retainer. For both retainers, those participants who did not comply, the majority agreed that they do not wear their retainer because it affects their eating (84.3%), speech (56.9%), comfort (47.1%), and breath odour (43.1%). A statistically significant difference in compliance levels in relation to the length of time since debond was also found (P < 001). Conclusions: The participants were more compliant with Hawley's than VFRs retainers and a significant difference in compliance levels in relation to the length of time since debond was found. Since 1930s Class II malocclusion benefits from functional appliances. These appliances alter the arrangement of various muscle groups to correct the position of mandible to grow out of the skeletal disharmony. These appliances have been broadly divided into removable and fixed functional appliances. Fixed functional appliances also known as “noncompliant Class II correctors” have gained significant ground in the last few years. With them in use, the treatment duration is reduced by 6 months. They are divided into rigid, flexible, and hybrid appliances. Rigid fixed functional appliances restrict the mandibular movements and flexible fixed functional appliances have frequency of breakage to a greater extent. To overcome these drawbacks, hybrid fixed functional (HFF) appliances have come into play. HFF appliances offer the advantages of previous ones, thus eliminating their pitfall. Recent advances have also lead to the improvisation with the use of HFF appliances. This review article provides the gist of different HFF appliances till date with their considerations in use, mode of action, biomechanical effects, and advances in this field. This case report describes the orthodontic treatment of an 18-year-old male patient who presented with straight profile, tongue thrust habit, proclined upper incisors, generalized spacing in the upper and lower arches, Katz Class II premolar relation unilaterally, and Class II canine relation unilaterally with increased overjet and overbite. 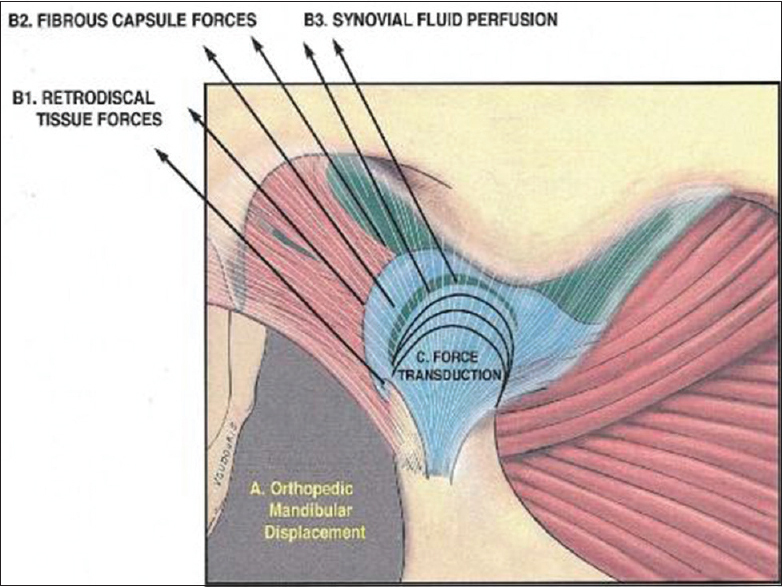 A butterfly system was used for the treatment combined with frictionless biomechanics in the initial stage of the treatment followed by continuous arch mechanics in the later part of the treatment. A tongued crib was used to stop the tongue thrust habit along with one elastic swallow exercise. Micro-implant anchorage was used unilaterally in the upper arch for retraction of the entire segment and correction of the unilateral Class II canine and premolar relationship. To avoid a dished-in profile, a nonextraction treatment was executed. Final correction of distally tipped canines was achieved using conventional Begg's uprighting auxiliaries in the vertical slots of the butterfly system in the finishing stage. The case was finished using bite-settling elastics. The total treatment time was 1 year and 2 months. Esthetic and functional goals were achieved satisfactorily with proper selection of biomechanics. The prediction of orthognathic treatment is an important part of treatment planning. The manual method of prediction tracing by Epker and Fish had been the gold standard in planning for orthognathic cases. Because it was time-consuming, hence computerized methods gained the popularity. 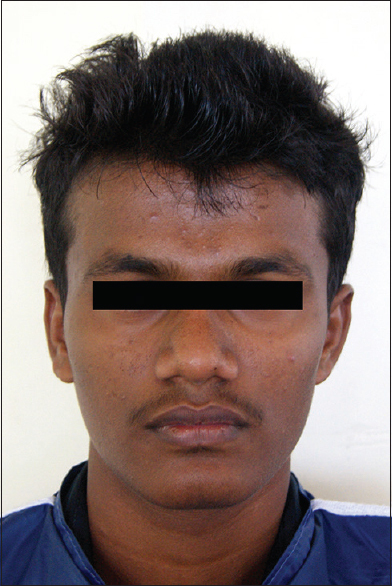 A 19-year-old boy reported with a chief complaint of forwardly placed lower jaw and poor smile for the past 2 years. Examination revealed the mandibular prognathism, obtuse nasolabial angle, posterior cross bite with reverse overjet of 1 mm–0.5 mm of overbite, and bilateral Class III molar and canine relation. There was also the deviation of 1.5 mm midline to left present. On the basis of findings, a diagnosis of mandibular prognathism was made. 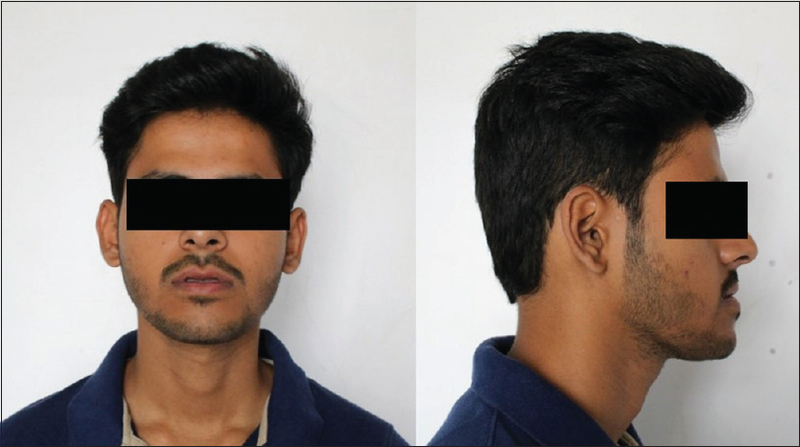 Treatment planning included an orthognathic surgery (Bilateral sagittal split osteotomy) for the mandibular setback. For the surgical procedure, both manual and computerized methods of prediction were done. Both tracing methods result was same and recommended the mandibular setback of 5 mm. Maintaining the achieved occlusion following the orthodontic treatment is the most difficult task of the entire treatment process. Relapses are common in noncompliant patients and in some cases despite the patient following the protocol. There are various factors for the relapse after the orthodontic treatment. The relapsed malocclusions can be corrected by simple procedures such as composite buttons. They are economical and esthetic considering the relapsed space. A 27-year-old female patient presented to our orthodontic department with the chief complaint of mild anterior spacing with midline diastema and anterior crossbite in relation to 21, after treatment with fixed appliance therapy. The patient was treated with composite buttons, and satisfactory results were obtained. Composite buttons are an alternate treatment line for mild relapsed cases in patients who are not willing to undergo the fixed appliance therapy again. Periodontally accelerated osteogenic orthodontics (PAOO) is a combination of a selective decortication facilitated orthodontic technique and alveolar augmentation. With this technique, one is no longer at the mercy of the preexisting alveolar volume, and teeth can be moved two to three times further than required for traditional orthodontic therapy. It is used to treat moderate-to-severe malocclusions in both adolescents and adults. PAOO technique increases alveolar volume which can provide a more intact periodontium, inturn decreases need for extractions, increases a degree of facial reshaping. This technique also increases the bony support for both the teeth and the overlying soft tissues. 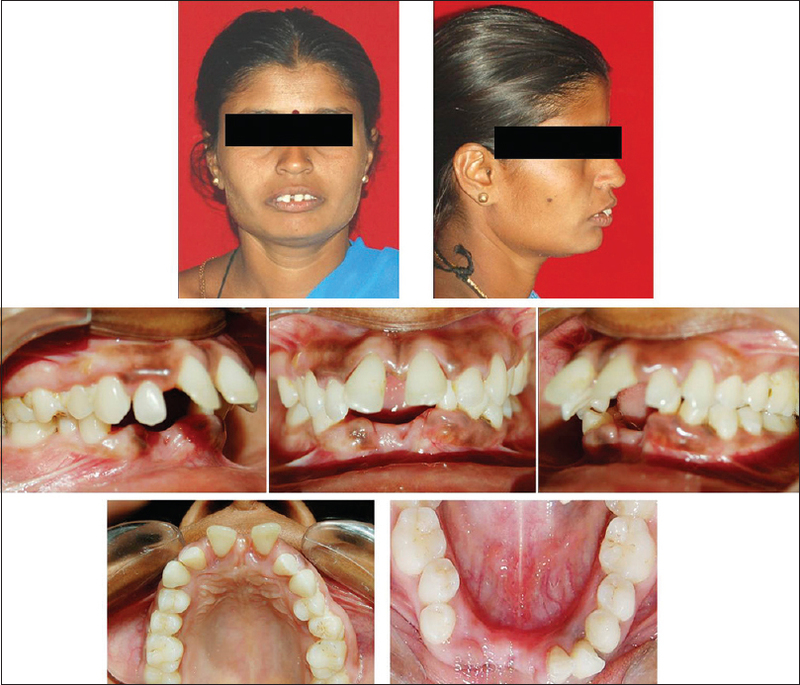 Here is a case report which highlights the above-mentioned uses with PAOO technique in a severe periodontally compromised Class II division1 malocclusion patient treated with nonextraction line of orthodontic treatment.